Last year we launched our new website. It’s been a labour of love, not to mention the many late nights of design and coding to get it where it is now. We’re delighted with the site and pleased with the positive feedback we’ve received from clients as well as an upturn in traffic and inbound leads. Although the planning and strategy phase took longer than anticipated, it’s been completely worth the extra effort. Throughout the project, we kept a strong focus on what our clients expect to see from a design agency website, and in doing so, we hope our website reflects everything that our business is (and aspires to be) from our service offerings right through to our company values and brand personality. With design and online technology moving faster than ever, we spent a good deal of time focusing on the top priority features our new site required. A website that was cutting edge three or four years ago would almost certainly appear a little dated today, both aesthetically and functionally. – How does your website measure up against your business today? – Does it still mirror your brand? – Is it still a true reflection of the services or products you offer to your customers? – How hard is your website working for you by bringing in the traffic and leads you expect? Human connections are at the core of every business, so telling your own unique story on your About us page will help set your brand apart, and allow you to share information with your visitors, for example who you are, what you do and why you’re doing it. Sharing customer testimonials on your website is a great, cost effective way to show visitors what you’ve already achieved, build credibility and earn trust. It’s easy for you to say you’re great to work with but it doesn’t hold the same weight as one of your clients voicing their opinions. Add as many customer testimonials to your website as you can. Just over one year ago, Google announced they would prioritise responsive websites over desktop versions when searched on a mobile device, meaning that if your website is mobile-friendly, it will rank higher in the search results. One year on, Google is not the only reason your website will be received more favorably by visitors if built responsively. According to a recent Ofcom report, smartphones are now the most popular way to browse the Internet in the UK, meaning it’s essential for your website to look exceptional both on desktop and a mobile device. Navigation is your websites’ roadmap and will depict how user-friendly it is to direct the visitor to what they are looking for. Things to consider here are logical page names, call to actions, how you want your content to be linked. Clear, easy navigation will contribute to an overall positive visitor experience to your website. Exceptional copy is one of the most valuable elements to your site and can make the difference between a good online presence and a great one. 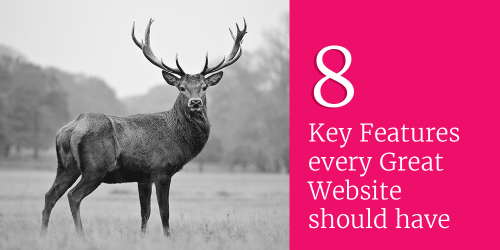 The key to getting this right is to give your visitor the right information in as few words as possible. Try to ignite their interest, whilst communicating in a tone of voice and language to convey your brand. It’s a really useful skill to master if you can do it yourself, but if writing is just not your thing, hire a professional copywriter. This is an area you can’t afford to get wrong. As with great copy, the photography and imagery you choose to use on your website are key to really engaging your visitor and encouraging them to stay on your site longer; it will also help to tell your story. If budget allows, hiring a professional photographer will ensure your images are unique, bespoke to your business and show your personality. If you feel ready for the commitment of writing on a regular basis, then a blog is a cost effective way to promote your business and your brand. A good hosting provider is really essential and needn’t cost a lot. On the other hand, a bad hosting provider could cost your business in lots of ways, for example it may contribute to slow loading speeds, which could then have a knock on effect on your SEO rankings. Whilst this is not an exhaustive list of key features, we hope it’s given you a starting point when considering your own site, how it’s currently working for you and what can make a difference to your business in the future if you decide to make some improvements to your website.